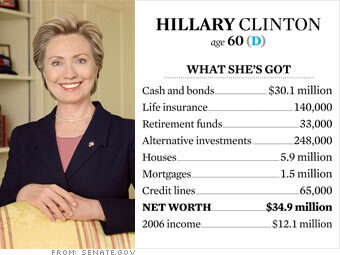 When Bill Clinton first ran for President in 1992, Hillary provided most of the couple's income working for the Rose law firm in Little Rock; he earned only $35,000 a year as governor of Arkansas. But it's been Bill's great gift for gab that has really feathered the Clintons' nest. He earned an astounding $41 million speaking to groups and corporations in the first six years since he left office. Standard fee: $150,000. The fact that he may be married to the next President can only burnish his star power. Until May 2007, the Clintons had cash and a blind trust. When Hillary launched her campaign, however, she (and Mitt Romney) had to "unblind" the trust to comply with Executive Branch rules, so the contents became public. The Clintons' money was spread among 190 mostly large-cap stocks from A (Abbott Labs) to Y (Yahoo) with a sprinkling of New York State and U.S. bonds. Jason Mirsky of RiskMetrics assessed the portfolio as aggressive but not foolish. A Black Monday event, he says, would have lost the Clintons about 16.5 percent of their portfolio's value. Anxious about potential conflicts, the Clintons sold everything but the U.S. bonds. Allan Roth of Wealth Logic estimates the move cost $500,000 to $1.8 million in taxes. "They have done their fair share to shrink the budget deficit," he says. The Clintons' cash hoard leaves them exposed to inflation, says Roth. Federal and state taxes put them in the 40 percent bracket, so the after-tax net on a 5 percent yield would be only 3 percent. The Clintons should invest half their money in the stock market, using broad index funds to avoid conflicts of interest. If they set up a new blind trust, they should confine themselves to 30 to 50 securities. "With the old portfolio," says Mirsky, "they had a lot of fragmented positions that didn't do much but add to their transaction costs."